Rabbit Pet: Rabbits Diet: Is Your Rabbit Eating Right? Rabbits Diet: Is Your Rabbit Eating Right? The typical diet for a pet rabbit consists of water, hay, pellets, fresh vegetables, and its own caecal pellets. Fruit and other treats are given only in very limited quantities, as they can cause obesity in a rabbit. Rabbits require a constant water supply as they dehydrate quickly. Most sources recommend 80% of the diet should be Timothy hay or another grass hay. Too many vegetables in a rabbit's diet typically leads to diarrhea and other digestive problems. Rabbits are generally fed a pelleted feed available from pet stores, supermarkets, and farm suppliers. 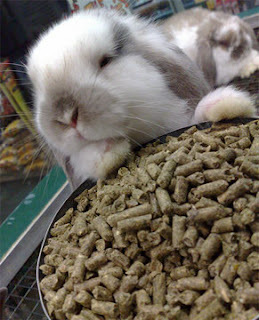 Pellets were originally designed for rabbit breeders for the purpose of providing as much food energy and vitamins as inexpensively as possible. This is optimal when the rabbits are being bred for food or for experimentation. Most sources recommend a minimum of 18% fiber, low protein (14-15%), and less than 1% calcium. Depending on the amount of vegetables available, an adult rabbit should be given between 20 ml to 40 ml per kilogram body weight daily. Pre-adolescent and adolescent rabbits (7 months and younger) can be given as much pelleted diet as they can consume, although additional vegetables are preferable to additional pellets. An older rabbit (over six years) can be given more pellets if they are having difficulty maintaining a steady body weight. Timothy hay-based pellets are great for rabbits that have stopped growing and do not need to gain weight. Alfalfa-based pellets are best only for young, growing rabbits or older rabbits who are under-weight. Hay is essential for the health of all rabbits. A steady supply of hay will help prevent gastrointestinal stasis and other digestive tract problems in rabbits. Additionally, it provides a number of necessary vitamins and minerals at a low food energy cost. Rabbits enjoy chewing on hay, and always having hay available for the rabbit may reduce its tendency to chew on other items. Timothy hay and other grass hays are considered the healthiest to provide the rabbit. As a persistently high blood calcium level can prove harmful to the rabbit, hays such as alfalfa and clover hay should be avoided. Alfalfa is also relatively high in food energy, and a constant diet of it can cause obesity in rabbits. Treats are unhealthy in large quantities for rabbits, just as they are for humans. Most treats sold in pet stores are filled with sugar and high food energy carbohydrates. If an owner is determined to feed the rabbit treats, the best treat to provide it with is fruit. Acceptable fruits (seeds and pits MUST be removed): Banana, Mango, Pineapple, Peach, Apple, Kiwi, Berries, Orange and other citrus fruits. Pineapple, mango, and papaya all contain a natural enzyme which is thought to reduce hairballs. Fruits or other treats must be given in moderation, as rabbits easily become overweight and suffer health problems. Their diet should consist of no more than half a tablespoon of fruits or treats per day. However, fresh fruits should not be given to rabbits under the age of 4 months because their digestive systems are not always developed enough to handle the fruit. It can cause enteritis that causes death within 48 hours. While a common myth that rabbits should be given lettuce, this is not a good idea because it contains little to no nutritional value for the rabbit and again can cause enteritis which leads to a quick death. Do not be alarmed if you see your rabbit eat some of his feces. These are called cecal pellets, and are a vital part of his diet. Caecal pellets are soft, smelly, clumpy feces, and are a rabbit's only supply of Vitamin B12. Due to the design of the rabbit's digestive system, they cannot extract some vitamins and minerals directly from their food. At the end of their digestive system is an area called the caecum where cellulose and other plant fibers are broken down and ferment. After they have been broken down and passed, a rabbit's digestive system can finally extract the vitamins from them.